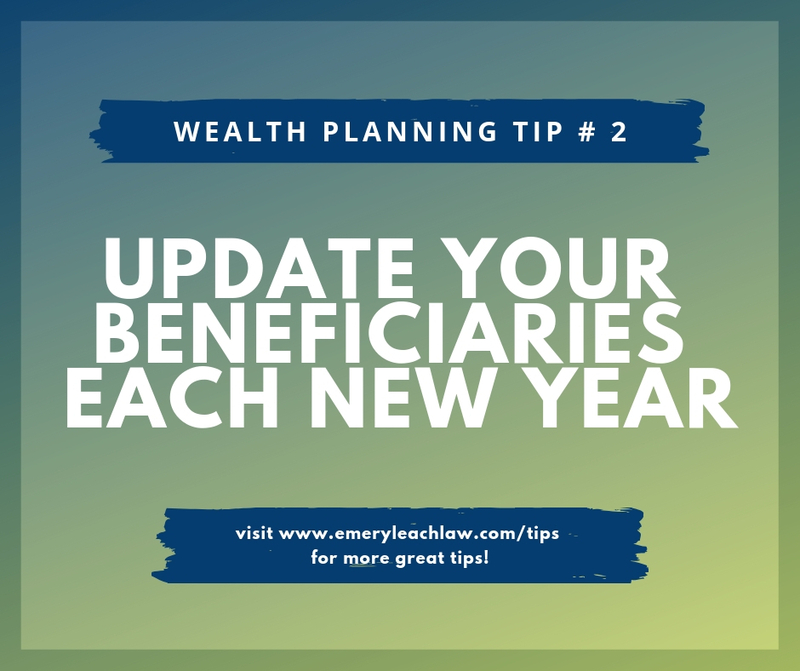 You are here: Emery Leach > Articles > Tips > Tip: Update Your Beneficiaries each New Year. Take a deep breath in. Do you smell that? It’s that new year smell. It’s time for new resolutions, new habits, and it’s also time to review your beneficiaries. If you’re like most Americans, you have your retirement plan and your life insurance handled through your work. You may also have an IRA floating somewhere and a standalone life insurance policy that you bought from your friend’s wife who is an insurance agent. When was the last time that you looked at any of your plans? Life changes as we age and with those life changes come big things, like a spouse, kids, a house. Each one of these big life changes means it’s time to check your beneficiaries. 1. If you have a pension through your job, contact your HR department and find out who your plan representative is. 2. Ask your HR department for your beneficiary information on any workplace life insurance policies. 3. Contact your plan representative and request a copy of your Beneficiary information. 4. Contact your insurance agent to get a copy of your Beneficiary information for any life insurance policies you’ve purchased. 5. Go to your bank’s online portal and see if your banking accounts have beneficiaries listed. 6. Compare the beneficiaries on all of your retirement accounts, life insurance policies, and bank accounts. Do you have a former spouse listed? Do you have your parents listed and you’ve since married? Do you have anyone under the age of 18 listed? it was part of the property settlement agreement. directly receive an insurance payout or a retirement plan. Having inconsistent beneficiaries without an overall plan. 9. Tidy up your beneficiaries. Complete new beneficiary forms if necessary to change a beneficiary. 10. Store everything that was updated in a secure location so you can easily access it next year. ← How Long Will It Take to Get Your Inheritance?